NOTIFICATION: Directorate General, Central Industrial Security Force (CISF), (Ministry of Home Affairs) inviting online applications for filling up 429 vacant posts of Head Constable (Ministerial) for direct recruitment and HC/Min (LDCE) for departmental, from Male & Female eligible and interested willing candidates. It is latest & good information for unemployed personnel those who are looking for these new Jobs in Government sector & other organizations. Job seekers, who wish to apply for these vacancies regarding CISF Constable Recruitment 2019, must have passed 12th/Intermediate/Senior Secondary/10+2 or equivalent and must be in position of having knowledge of typing in Hindi and English. Applicant’s upper age should be as per Govt. rules and age relaxation is applicable to all reserved category candidates i.e.SC/ST/Ex Servicemen candidates etc. NO OF POSTS: 429 vacant posts of Head Constable (Ministerial) in Central Industrial Security Force (CISF). 1. Direct Male: 328 posts. 2. Direct Female: 37 posts. EDUCATIONAL QUALIFICATION: A passed of Intermediate/ Senior Secondary School certificate (10+2) exam or equivalent qualification from any recognized Board. SKILLFULNESS: English Typing with minimum speed of 35 wpm on computer or Hindi Typing with minimum speed of 30 wpm on computer (Time allowed -10 mts) (35 wpm in English and 30 wpm Hindi corresponding to 10500 KDPH in English/9000 KDPH in Hindi with average of 5 key depression for each word on computer). 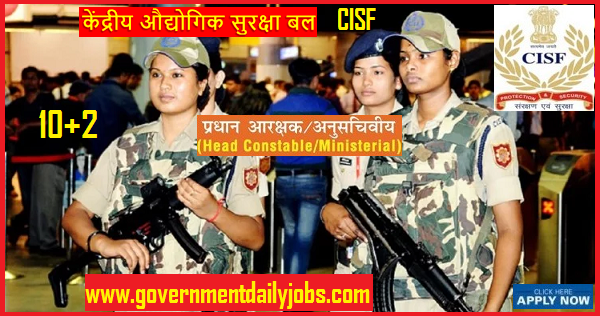 AGE LIMIT: Candidate’s required age should be in between of 18 years – 25 years as on 20-02-2019 for CISF Recruitment 2018 | 429 Posts | Head Constable (Ministerial) Jobs. PAY SCALE: Level-4 in pay Matrix (Rs.25500-81100/-) (Pre-revised Pay Band Rs.5200- 20200/- + Grade Pay Rs.2400/-). • Male Height: Others- 165 cms and ST -162.5 cms. • Chest: Others- 77-82 cms and ST- 76-81 cms. • Female Height: Others- 155 cms and ST- 150 cms. • Weight – Correlated with Height & Age. • Eye Sight – For Near/Distant/Refraction & other vision parameters. REQUIRED APPLICATION FEE: For said vacancy a non- refundable application fee is to be paid by the candidates as per rules. General & OBC category candidates should pay Rs. 100/- through online mode or SBI chalan. SC/ST/Women/Ex Servicemen candidates are exempted of paying fee. POST RESERVATION: All reserved category candidates ie. SC/ ST/ Ex Servicemen (as applicable) are being selected for said post/s as per existing Govt. policy/rules. 1. Height Bar Test (HBT). 2. Physical Efficiency Test (PET). 3. Physical Standard Test (PST). 5. Skill Test (Typewriting test). 6. OMR/Computer based written test in Hindi & English. The recruitment process will consist of Physical Standards Test (PST), Physical Efficiency Test (PET), Written Examination and Medical Examination. i. OMR/Computer based written examination which will be bilingual i.e. Hindi & English. ii. PET/PST, Documentation & Skill test. INQUIRY: Candidates may contact Help Line Number 011-24366431 /24307933 for clarification, if any, in respect of filling applications and PET/PST, Skill Test, Written Examination and Medical Examination etc. A- General Studies/Elementary Science: 25 questions – 25 marks. B- General Intelligence: 25 questions – 25 marks. C- Arithmetic Ability: 25 questions – 25 marks. D- General English/ Hindi: 25 questions – 25 marks. Skill Test Norms on Computer: English typing with minimum speed of 35 WPM on Computer or Hindi Typing with minimum Speed of 30 WPM (Time allowed- 10 mts). • Analytical Aptitude and Ability. • Principally of Non – Verbal Type. • Coding & Decoding etc. • Current Events – National & International. • Science & Technology etc. • General Science up to 10th Standard. • Computation of Whole Numbers. • The relationship between Numbers. • Fill in the Blanks. HOW TO APPLY: For said posts (CISF Head Constable (Ministerial) Recruitment 2019 | 429 Head Constable (Ministerial) Posts) eligible, willing and interested candidates may apply through online mode at official website up to last date. Applicants must retain with them application form for future reference. 2. Open the career section and click on CISF Head Constable/Min Recruitment Exam 2019. 4. Click on Apply now and fill in the application form as required. 5. Upload the scanned documents and photograph. 7. Verify the filled in details are correct and click on submit button. 8. Take a printout of filled application form for future reference. CONTACT ADDRESS: Central Industrial Security Force (CISF), CGO Complex, Lodhi Road, New Delhi. CONCLUSION: Central Industrial Security Force (CISF), New Delhi invites online application for the recruitment of 429 vacant posts of Head Constable (Ministerial) on regular basis from Indian residents who are eligible & interested; candidates can apply through online application. LAST DATE TO APPLY: 20-02-2019 for CISF Recruitment 2019 Apply Online for 429 Head Constable/Ministerial Posts.